I stayed away from the lead-ups to the 9/11 commemorations. I did not need to see the photos again: They are still in my memory. I did not need to remember where I was that day: I can never forget. Growing up in Queens and hanging out in Manhattan, the World Trade Center was a part of the backdrop of my youth. My dad took us to the observation deck, and it was cool, but you could always do it. When I was a volunteer for South Street Seaport Museum, I took the E train from my stop at 179th Street in Jamaica, all the way to the end of the line, WTC, went upstairs and walked east on Fulton Street. From the museum ships, you could always see the towers. After high school, a couple of my friends worked at the Barnes and Noble Classical Annex on the concourse of the trade center. I myself worked at Benjamin Books, also on the concourse. Of course, always doesn’t really exist. While I didn’t know any of the people who died that day, I still felt the loss. When my brother got married and I flew into NYC, Long Island-Islip, actually, the plane banked around the south end of Manhattan. It didn’t look the same. It didn’t feel the same. So, here I was last Friday, driving from my doctor’s appointment to something else, and I just happened to drive up to Fine Arts Drive. A huge American flag had been hung in front of the Art Museum, and as I walked around, I saw that an installation of American flags was planned for the Great Lawn. 2996 flags to be exact, one for every person murdered that day. Each name was to be on its own flagpole. I went back Saturday night after the installation. I went back Sunday morning. 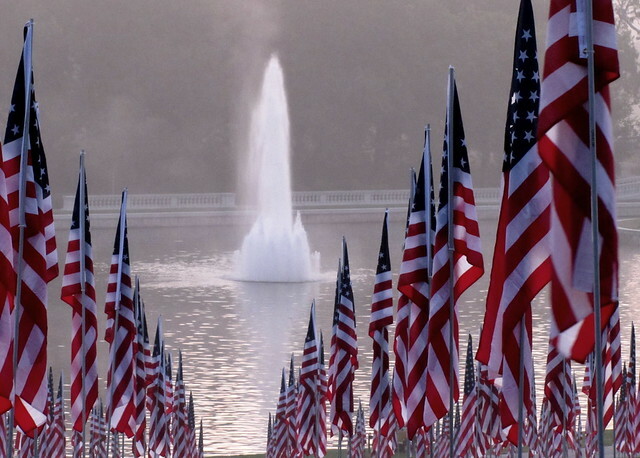 Sunday morning at dawn, the mist slowly burned off the Lawn and the Basin, and made the flags glow. This is my memorial offering.